Keywords: Giardia, Giardiasis, Intestine, Treatment, Resistance, Metronidazole, 5-nitroimidazoles, Target, Gastrointestinal disease, Intestinal modifications. Keywords:Giardia, Giardiasis, Intestine, Treatment, Resistance, Metronidazole, 5-nitroimidazoles, Target, Gastrointestinal disease, Intestinal modifications. Abstract:Giardia intestinalis infection causes enterocytes damage and loss of brush border of the epithelial cells of the intestine that leads to shortening of microvilli and altered epithelial barrier function. This pathology results in aqueous diarrhoea, steatorrhea, nausea, abdominal pain, vomiting and weight loss. However, most infections are asymptomatic. The main consequence of Giardia colonization is nutrients malabsorption. Several families of drugs with good efficacy are used for Giardia treatment, but sometime dosing regimens are suboptimal and emerging resistance begins to question their clinical value. Moreover, some of these drugs can cause side effects that result in patient discomfort and low adherence to the treatment. This paper reviews the drugs currently used for the treatment against Giardia: the mechanism of action, the efficacy, the normal dosing, side effects and in vitro and clinical studies. 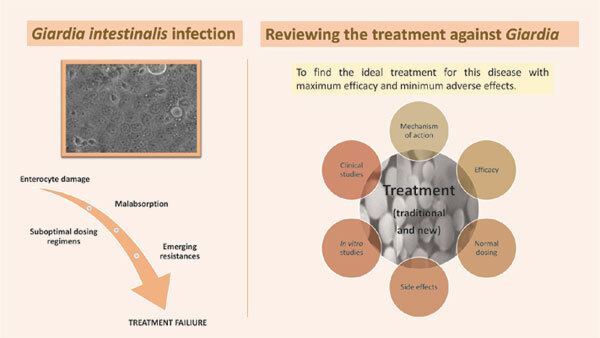 In addition, new therapies against Giardia such as those based on phytochemicals, Lactobacillus and nanotechnology are collected in this paper, trying to find the ideal treatment for this disease with maximum efficacy and minimum adverse effects.